Contamos con dos estacionamientos y un seguridad en cada uno de ellos. Los estacionamientos se encuentran en cada lateral de nuestro Restaurante. Disfrutarás de la hermosa vista sobre La Laguna así como de las hermosas Tortugas que habitan en ella. Nos transportamos a donde nos necesites con nuestro servicio de Banquetes y Menú especial para cualquier tipo de evento. Cabe mencionar que Nuestro Chef se encarga del servicio de cocina personalmente. Restaurante de Mariscos, aquí podrás encontrar el mejor Pescado Zarandeado de la región. En Mariscos Tinos La Laguna encontraras un excelente menú con los mejores platillos de mariscos que hemos estado sirviendo por más de 20 años. Raicilla Hacienda El Divisadero Bco. Great food, interesting setting. It was on the edge of a lake and had turtles and crocodiles swimming in the water by the restaurant. Delicious whole red snapper, just too large for 2 people. Luckily, we were able to take it back to our condo for lunch the next day! Good drinks, etc and very reasonable. We have dined here for the last five years while vacationing and have always enjoyed the service and food-until tonight. It was a light crowd and our orders were taken quickly but our waiter disappeared so a second round of drinks was out of the question. Our food didn’t arrive until an hour later and only after I asked twice. Very disappointing. Lo único malo fue que llegamos y nos dijeron que no tenían la reservación, pero luego corrigieron y nos la dieron. La Laguna has been the best local restaurant in Nuevo for the past decade! Excellent food and tons of choices. The service and friendliness is second to none. Excellent value and we go back here every year a few times each visit. Highly recvomend a dinner here! The food and service is excellent. So friendly and accommodating. This isn’t a fancy restaurant, it looks like a hole in the wall from the outside, but once you ate inside, its much different. Order any seafood.. it’s so fresh and there are so many ways they prepare things, simply delicious. We have been coming here for over ten years and we are never disappointed. Dinner for three adults and one child with drinks was $82 with a very good tip, that’s pretty good in my book. Had great dinners- fresh jumbo shrimp prepared and way you wanted! We had Bacon Wrapped, Coconut, Garluc and Red Sauce. Superb. 1 person had Chicken which was so-so. Desserts were excellent Huge piece of Flan and Cicinut Uce Cream- yummy. Great to see the turtles and bird life at the lagoon. My family has been going to Nuevo Vallarta for over 20 years. A couple of years ago we discovered Laguna Tino's. This year we brought 7 teenagers with us because my daughter and her 4 best friends just graduated from high school...it was their grad trip. Our dinner at Laguna Tino's was okay this time too, except for the one server that took a fancy to my daughter. The girls thought it was funny but I thought it was highly inappropriate. He would touch her whenever he passed by. Her friends would form a circle of security around her every time he tried approaching her. Food is very good there but I could have done without the added attention. Excellent food and service in a great location. We have been coming back for years and standards have been maintained. Keep it up, La Laguna. Open air dinning with great sea food and responsive wait staff. Looks over a small lagoon with hundreds of turtles looking for a hand out. One minor problem with not enough tomato sauce on spaghetti which was handled gracefully. Great place for tourists and locals. Every year we visit Nuevo Vallarta we always make an effort to eat here. Always delicious and a great value! Has been consistent for years! The service and food was outstanding. It was our friends first visit and they are ready to go back. Ceviche was wonderful! La Laguna was a gem of local culture. This is not for the "Grand Mayan" crowd who doesn't want to mingle with the locals. It's a 5 minute cab ride from Paradise Village and the Marina area in Nuevo Vallarta. It's on the Lagoon with (covered) outdoor seating and wooden floors, excellent food and service. This is what you go to Mexico for. Do not miss the MEXICAN COFFEE for desert...flaming great. Do make a reservation if possible. We come here for the red snapper every time we are in town. Delicious. They Bring the fish out to show you first. Good side dishes. Great service and prices. Feels pretty local. Nothing fancy, but GREAT snapper, for sure. Wonderful meal. Eddie was our server. Fantastic!! 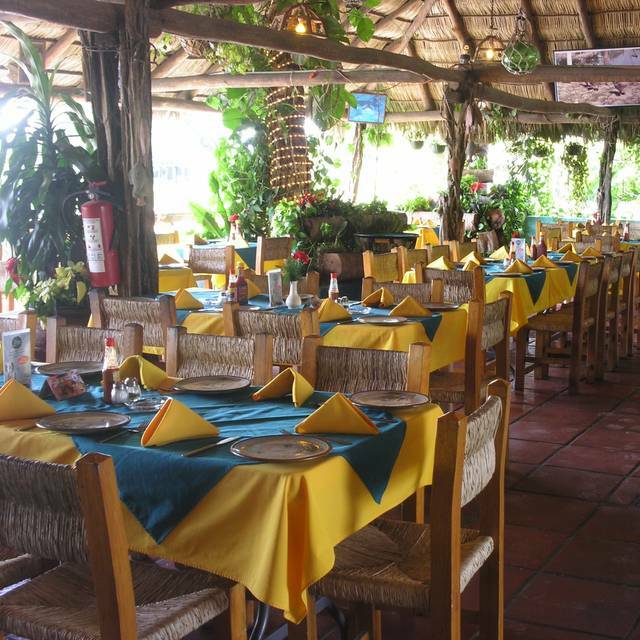 We have dined here twice in Nuevo Vallarta due to it's proximity to our resort. The seafood is local, fresh and well prepared. The open air setting by a lagoon is peaceful. Unfortunately, the host chose to give us an unwanted time-share pitch at our dinner table, and again as we were leaving. We made it clear in both instances that we weren't interested, but he persisted. We thought this stuff had quieted down in PV. We'll go again, but be more forceful in rebuffing the approach as soon as we recognize it. This was our 4th time there; the best coconut shrimp I’ve ever had! Will definitely come back. El servicio fue bueno, excepto por el tiempo en que nos trajeron los alimentos, casi una hora. This place had fantastic seafood. I ordered a massive platter of different items and everything I had was amazing. My girlfriend ordered some sort of baked clam dish with bechamel and cheese that was a little odd and offputting, but everything else was amazing. The platter had lobster in garlic butter, grilled shrimp, crab legs, broiled fish - all were outstanding. I also had a shrimp quesadilla that was pretty bland and flavorless. The ambiance was also pretty cool - this place sits right on the lagoon where you can see dozens of turtles swimming and sunning themselves. The only disappointing thing was that they don't make their own chips they came in a package. It was just OK. A lot of better options in the area.